When she was a clarinet student in the 9th grade, Kathy decided that she wanted to become an instrumental music teacher. Her resulting career has spanned the past 40 years, with Kathy serving as an instrumental classroom teacher at the elementary, middle, and high school level, and the supervisor of the instrumental music program in 200 Prince George’s county public schools. She plays clarinet, trumpet, trombone, sax, guitar, cello, piano, and occasionally steel pan. 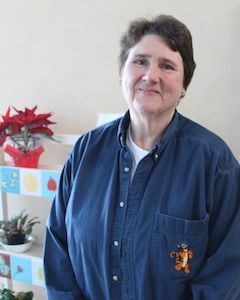 In her spare time, Kathy is active in her church and animal welfare groups; she’s fostered and placed 13 kittens in the last year alone. Kathy has two daughters who have graduated from FCS and now attend Elizabeth Seton.